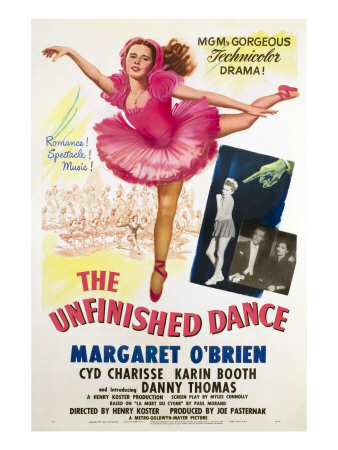 After my interview with Technicolor specialist Robert Hoffman and in honor of this weekend’s Dance Media Festival, I decided a review of The Unfinished Dance (screening at the festival this weekend) was warranted. And, honestly, I have no one to blame but myself for not watching this earlier, considering it stars my favorite child actress, Margaret O’Brien, and one of my favorite dancing actresses, Cyd Charisse. It was all worth it because The Unfinished Dance is a heartwarming, highly sentimental film that only someone like director Henry Koster (helmer of the equally enchanting The Bishop’s Wife) could put his touch on. Aspiring ballerina Meg Merlin (O’Brien) idolizes rising star Ariane Bouchet (Charisse). But when Ariane is usurped by prima ballerina La Darina (Karin Booth), Meg decides to humiliate the dancer by turning off the stage lights. Unfortunately, Meg ends up hitting a lever lowering a platform, causing La Darina to fall, threatening her dancing career forever. Wracked with guilt, Meg finds it increasingly difficult living with her mistake. 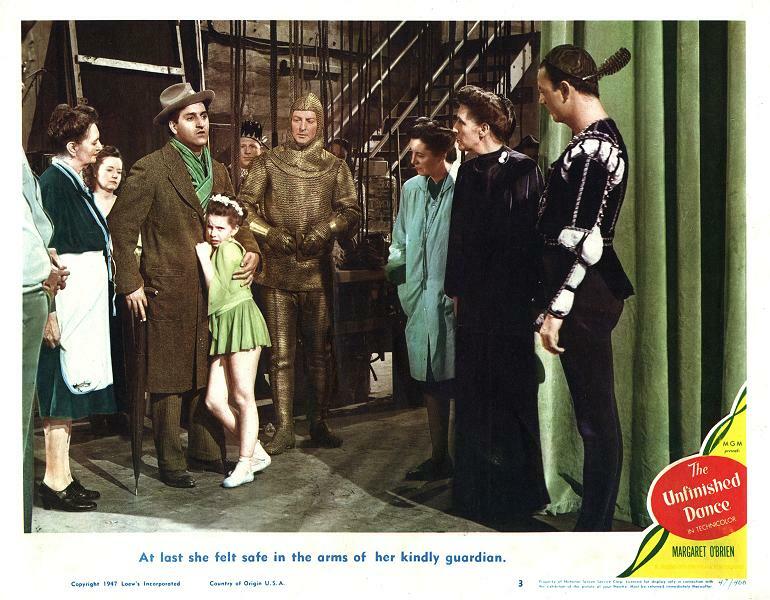 Koster was a director well-regarded for his heartwarming, sentimental message movies (along with the prior mention of The Bishop’s Wife, he also directed Come to the Stable, Good Morning, Miss Dove, and Mr. Hobbs Takes a Vacation) as well as his work with children. I have to question the pitch session for this film. “It’s about ballerinas, only one’s a little girl who ends up committing attempted murder and then feels really bad about it.” In fact, the dialogue reads like it should be spoken by actresses far older than the children assembled. When Meg’s friend Josie (Elinor Donahue) learns Meg took her part opposite Ariane in an upcoming performance, she says it’s because of Meg’s “political influence.” There’s an inherent camp quality within the lovable morality tale as it often feels like these are kids acting out an older drama. I know some people find Margaret O’Brien to be the acting equivalent of Damien from The Omen (not naming names coughIvanGShrevecough). However, I found her just as delightful in this as in other films like Our Vines Have Tender Grapes and Meet Me in St. Louis. Meg Merlin hews a bit closer to her character in Our Vines, as both are stalwart with strong principles that end up getting them into trouble. Although, in Meg’s case, her principles hobble a woman. Meg, a ballerina true believer, clings to the fear that “if a dancer can’t dance anymore, she just dies.” So when Ariane hears La Darina will be dancing her parts, Meg takes her adage to heart….literally. Although, in her defense, Cyd Charisse’s face contains all the melancholy of a deserted forest….it’s sad is what I’m saying. Margaret O’Brien, little mistress of the side-eye, accidentally hurts La Dorina, and the rest of the narrative involves her dealing with her guilty, and dancing. The dancing here is nothing short of spectacular; Koster and crew only film the actresses in long shots, so you can see there are no dance doubles. (I’m assuming Booth didn’t do her own dancing as she’s filmed in close-up predominately.) Coupled with the cavernous sets and candy-coated confectionery costumes and you have one of the most gorgeously filmed movies I’ve seen lately. The fact that it’s considered a Technicolor highlight – filmed by legendary cinematographer Robert Surtees, no less – makes sense. Speaking of Surtees, there are sequences here that are simply breathtaking, particularly Meg’s confrontation with The Devil – designed right out of The Red Shoes – and the finale are particularly memorable. Compared to past O’Brien movies, the young actress gives up quite a few of the tics she was famous for, particularly crying (there’s only one scene where O’Brien douses you with tears). She also knows when to keep her quiet. In fact, she’s so quiet for the film’s first 15 minutes, I assumed Meg Merlin was a mute. A lonely little girl raised by her absentee aunt – her aunt does “that kind of dancing” which I’m assuming was a 1940s way of saying she’s a stripper? – Meg seeks solace with the ballet (cue A Chorus Line’s “At the Ballet!”). She idolizes Ariane and who wouldn’t? Charisse plays the a consummate professional and her dancing is exquisite. Oddly enough, she’s the unintentional villain of the piece, forsaking the ballet for its fame and willing to throw it over for a guy. You end up rooting for her rival, La Darina more. This is my first time watching a movie with Karin Booth, an actress with the face of Kathryn Grayson and dancing on par with Charisse. The movie has a very basic rise and fall trajectory of the enduring star brought low alongside the ingenue turned diva (I found a lot of references to Showgirls in this movie…and I say that with the best intentions). Charisse’s shallowness and negligence of Meg, the girl who, unintentionally, gave her her success, leaves you rooting for the newly humbled La Darina, who becomes Meg’s new mother figure. Meg’s guilty conscious and the message about honesty never hits home, particularly because Meg never actually confesses, but by the end you support the trio of ladies in their individual dreams, and Meg makes up for it by telling Cyd to ditch the zero and keep her toe shoes! The Unfinished Dance hit on all the things I enjoy about films: dancing and Margaret O’Brien for starters. The film isn’t without its melodrama, including Charisse clutching a curtain and biting her hand, but it’s such a sweet movie with expert dancing and superb production design. Also, where else are you going to see Margaret O’Brien Hulk out and beat the snot out of a kid (she even tells the girl, “Don’t make me mad!”).